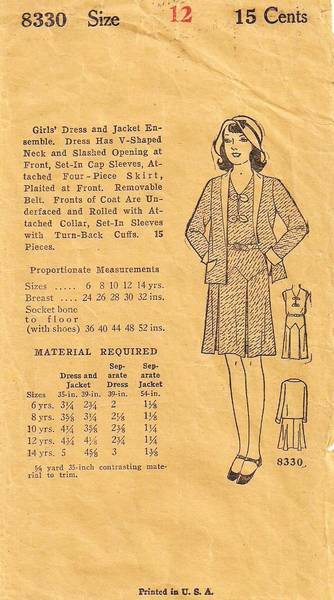 Vintage sewing pattern 8330 for Girls' Dress and Jacket Ensemble. Dress has V-shaped neck and slashed opening at front. Set-in cap sleeves, attached four-piece skirt and plaited front. Removable belt. Fronts of coat are underfaced and rolled with attached collar. Set-in sleeves with turn-back cuffs. Girls Size 12; Breast 30. Length (socket bone to floor - with shoes) 48 inches. No other measurements listed. Pattern is used and complete. Pieces are still supple and in good usable condition. Envelope is aged - looks to have been a golden yellow color paper originally - it is complete and supple. The is no Manufacturer's name printed any where on the pattern. This was enclosed in a parchment sleeve, printed "Ladies Home Journal"which could be the manufacturer but I believe that "Ladies Home Journal" always printed their name on the pattern itself. So, it's possible that the homemaker just put the pattern in the parchment outer sleeve for safe keeping. The sleeve is slightly tattered - it will be included with the pattern.